When a dory reaches for the sky and obtains maximum verticalness where the line between flipping upside down and remaining right side up, time seems to stop. Obtaining that finely demarcated brink between a wet swim or a wet ride, makes one’s world suddenly be put on hold. Or so it seems. Dancing on the edge of any kind of life precipice is where human values become much clearer. These experiences bring us much closer to ourselves. Our everyday ruttedness instantly morphs into a more focused purpose. Survival. 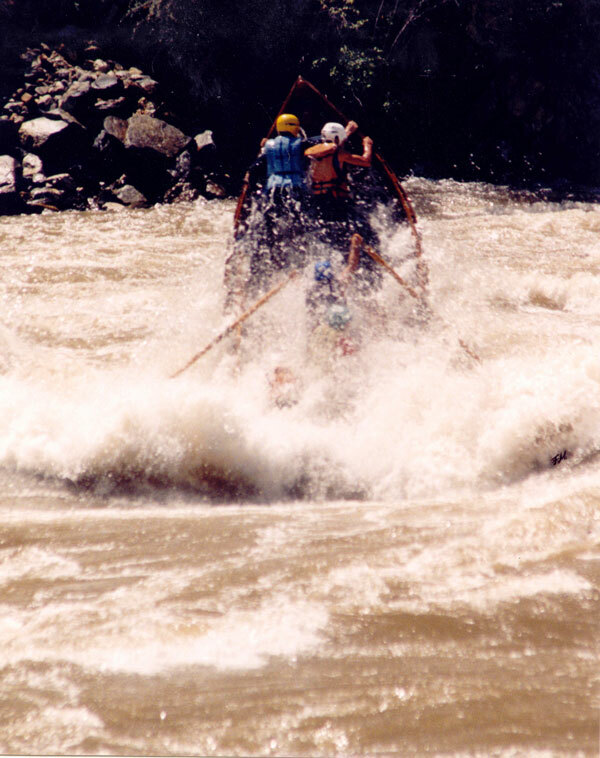 Running the legendary Ruby Rapids, on Idaho’s Salmon River, where one’s world can be changed in an instant, the predicament is a great metaphore for encountering any difficult barrier to whatever endeavor one might be engaged with. Often on extended river journeys, the chance for such an unexpected dragon head to surface and blow fire into our path, is increased. Whenever we are white knuckle “high-siding” to help keep a boat right side up, or coming face to face with any other wall of difficulty, we call this experience, a “Wapiti Moment.” (Taken from our company name – Wapiti River Guides). For example: on a previous float trip on Oregon’s Grande Ronde River, we had a two boat party for fishermen on a five day adventure. Of course, this is mostly an easy whitewater trip, so our true adenture soon came from something else. Kirk, the guide helping me, had stopped on an island for his elderly guests to get out of the raft to work some fly fishing water. Meanwhile, another private party upriver of us had tipped a canoe upside down and turned their trip into a helter skelter mess. When the canoe came by Kirk, it was floating upside down, making it impossible to tell if someone was still trapped underneath or not. They could be having a Wapiti Moment of their own. So he jumped in his raft and rowed out to help. Meanwhile I was below him fishing some other water and in a good position to also give chase, so yelled at him to head back to shore, immediately. He did not know the river as well as me, so did not realize that he could not get back upriver to where his guests were fishing. Thus, being abandoned, they had become trapped on the island, where it was too deep to wade to shore. After I secured the canoe, learning that there was no one underneath it, I beached my driftboat and walked back up to Kirk. The both of us then hiked back up to see how we could then rescue our own party. We were having a “Wapiti Moment.” Chilling out, we asked ourselves, what would MacGyver do? We designed a successful plan, which is an entire story just in itself, and saved our bacon. Now, whenever any difficulty on any of our trips might arise, we call it a Wapiti Moment. It is how the term evolved. A year later, Kirk was running his dogs in the famous Iditarod race of Alaska, and had a Wapiti Moment at a particulary difficult spot. He experienced a problem on a frozen river/pass and found a cool rock to gift me upon his return. He told me that it was a point he reached, when he had thought back of all the Wapiti Moments we had experienced together on past adentures. The rock was the touch stone that had reminded him of such. But like we always do, and he did then, he applied the MacGyver factor, and solved his problem. Moral of the story: Never say die. Don’t panic or lose your cool. There is always a way to keep your boat afloat, or sled on course.